A notorious Macau gangster known as "Broken Tooth" has been released from prison after serving nearly 15 years in China's special administrative region. Wan Kuok-koi was convicted of criminal association, loan-sharking and illegal gambling in 1999 - just before Portugal handed control of Macau to Beijing. 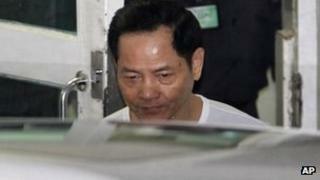 Wan, now in his late 50s, made no comments as he left the prison. Ahead of his release, the authorities warned casinos and hotels to tighten security and keep a close eye on him. But some analysts predict that Wan has lost much of his former power in Macau, which has undergone a major transformation since the 1990s. At the time, Wan was the head of the notorious 14K triad, which was notorious for ruthless turf wars with rival gangs for dominance in Macau's casinos. He even helped to finance a gangster movie, Casino, which is widely believed to chronicle his own exploits. Macau ended Hong Kong tycoon Stanley Ho's decades-long monopoly on the gaming industry in 2002, and foreign casino companies have been investing heavily in the enclave ever since. New "mega-casinos", which include major hotel developments, have now replaced traditional gambling dens.